Barcode encoding and decoding is extremely fast, effective and cheap process so it can’t be separate from modern business and life at all. 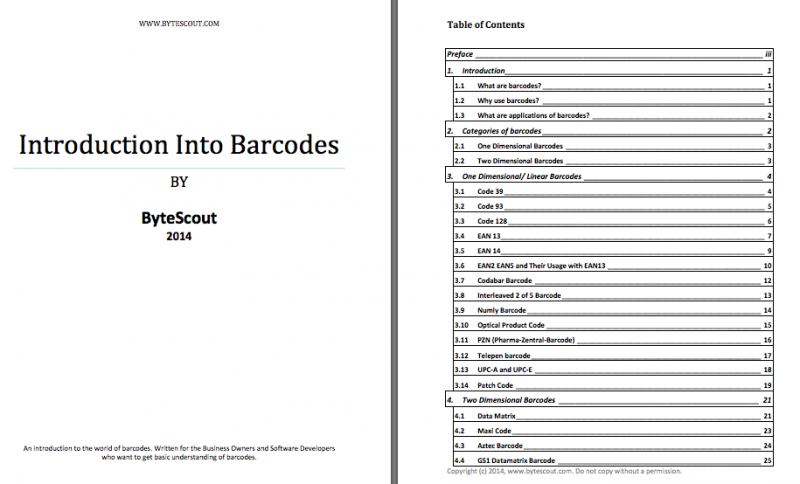 The book Introduction Into Barcodes by ByteScout contains base knowledge about types, structurе and categories of barcodes wide-using in business area from postal and transport services to medical and surgical industry. Introduction Into Barcodes describes characteristics of different barcodes, some interesting facts of their history and using. For example, which barcode looks at us with a bull’s eye and where quick response code was invented. This book will help as business owners to choose barcode suits their business needs so IT managers and software developers to integrate barcode into point of sale system, medical image system or any departmental store application.